In 2014, global FinTech investments totaled $9.9 billion; how is this innovation impacting the global banking industry? The banking industry is an evolving marriage between traditional brick and mortar banks and emerging FinTech companies. In 2014, global FinTech investments totaled $9.9 billion, and market intelligence reveals the market is expected to reach $19.7 billion in 2015. So, how is the increase of innovation impacting the industry as a whole? 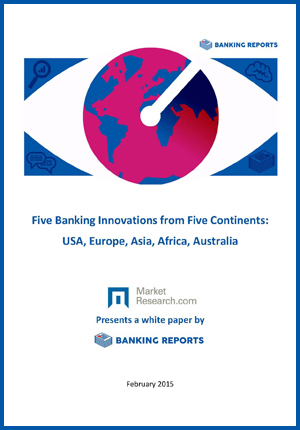 In Five Banking Innovations from Five Continents, banking and financial industry analysis reveals how banking innovations around the world are shifting market dynamics and the future of the industry. This white paper focuses on the FinTech Revolution throughout North America (USA), Europe, Asia, Africa, and Australia.